Norman DePear sadly passed away on 15th November 2014. 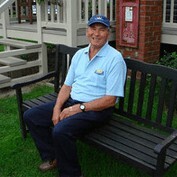 Norman made a huge contribution to the park and has made many friends over the years. We will be arranging a fitting tribute to him in the coming months.